Fritz and I went to his Neurology appointment on August 29th. We met with Dr. Bieber. Adam was, unfortunately, unable to attend, because he runs his own Ortho clinic during that time. He is growing fantastically 60% for weight and 70% for height (he was in the 10-15% range when he was born). His muscle tone looks fantastic and he is hitting all his milestones right on time. His head has also stopped jumping in growth and is now following a nice curve! Going to these appointments have a physical effect on me. I honestly just start dripping sweat (TMI, I know) and get so nervous. Even though I knew everything was going to be okay, there is always so much new information to take in and even more, decisions to make, we are always given so many options to think about. While we knew that Fritz didn't have Hydrocephalus as they thought he might due to rapid head growth, we also learned that he was completely misdiagnosed while in utero and when he was in the ISCN, and at each follow-up ultrasound. 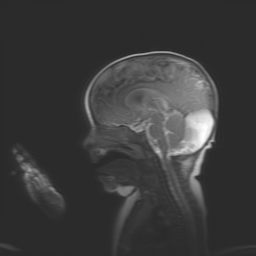 I'm so glad we did the MRI because we found out what was being screened on the ultrasounds wasn't extra space at all, but a really huge Arachnoid Cyst. We knew the cyst was there, after the MRI, just not ow LARGE it was. While it sounds scary by definition we truly do not have to be too worried, and for that we are thankful. In all honesty, Dr. Bieber told us to consider this a win. Taking Dandy-Walker and Mega Cisterna Magna off the table should be a relief. We aren't 100% in the clear, but our boy is 99.9% perfect and we shouldn't expect any developmental delays or dissabilities. The white portion is Fritz's cyst. Fritz does have extra fluid around his brain, largely due to his head size, 99.93% (oh man), and his ventricles do look a little a little enlarged (likely from the cyst keeping fluid from draining as quickly as it could or should). We will have a neuro follow-up when Fritz is a year old. At that time we will decide if we want to have the cyst drained and when it would be appropriate to do so. Our team is against putting a shunt in, due to the risk of infection and that was a huge relief. There is a procedure called Endoscopic cyst fenestration where the cyst can be easily drained without opening the skull or inserting a shunt. I asked our nureologist if there was any sense of urgency to get a neurosurgey consult and his answer "nope!". Right now Adam and I are so thankful to be able to focus on our healthy and happy baby. We are one step closer to being able to formally close the door on this chapter and it is a relief. I'm going to tackle the story of our sweet Fritz in three installments: in utero, birth - six months and where we are now. Please know I am not a medical professional and while this was scary, sad and traumatic Adam, Fritz and I are blessed beyond belief with the medical care we were provided and the end result of this journey. At our 27 week Ultra Sound appointment the tech left the room, "to make sure she got all the images the physician needed." I was calm ,at peace, I just saw my perfect baby boy wiggling around. When she came back in, Dr. Rose, was with her, but he was smiling. I was confused. "So...we noticed your baby has some extra space in his brain." All I heard was "YOUR BABY HAS A BAD BRAIN AND EVERYTHING IS GOING TO BE WRONG WITH HIM." I held my composure until the doctor left the room. And then cried and cried and cried, while my husband held it together for the both of us. Dr. Rose returned with 32 pages printed out for me. Out of those pages, three sentences were highlighted on Mega Cisterna Magna. Sounds simple enough right? Fritz had a large space at the back of his brain. Most findings are a variant of normal, but when you're 27 weeks pregnant, you assume the worst. Dr. Rose also used the term Dandy-Walker Malformation and said our biggest concerns would be developmental delays and hydrocephalus. Worst case scenario our baby would be developmentally delayed and would need a shunt put in to drain the fluid from his brain into his stomach. It was a lot to take in, but the worst part was not knowing. Knowing if something was wrong or if this was just an incidental finding. Dandy-Walker Malformation is incredibly rare. I would encourage you to read more about it here. I think about those children every day and how special and loved they are. I also think about the parents right now sitting at home wondering if their baby is going to be okay, the mom looking down at her perfect belly, just wishing away her worries and asking "why me? why my baby?". Sometimes there are no answers and if there are, those answers can be so hard to find. Most of the time you just have to wait. So we did. We waited until 38 weeks when Fritz would join us earthside.